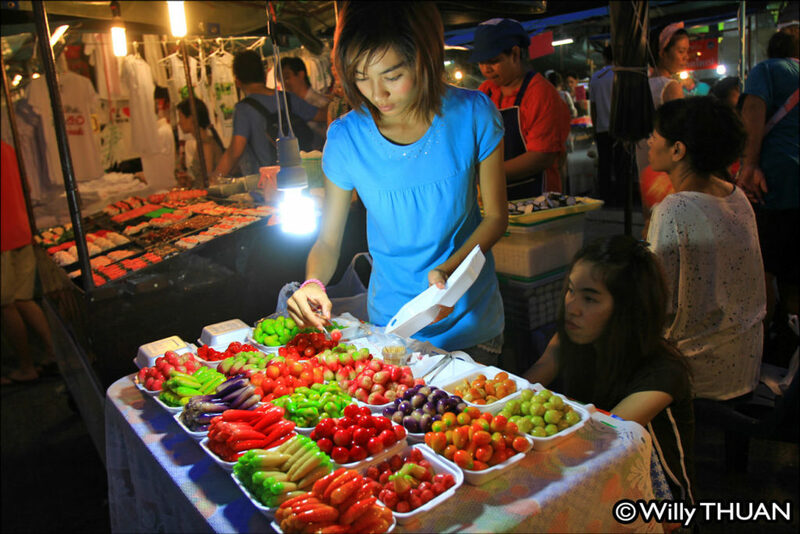 What to Buy at Phuket Weekend Market? Where is the Phuket Weekend Market? 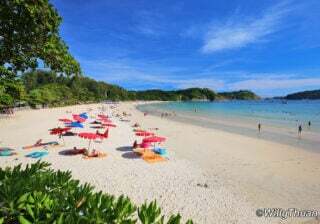 Where is Phuket Weekend Market? Phuket Weekend Market or Naka Market is an immense night bazaar located near Central Festival in Phuket Town. 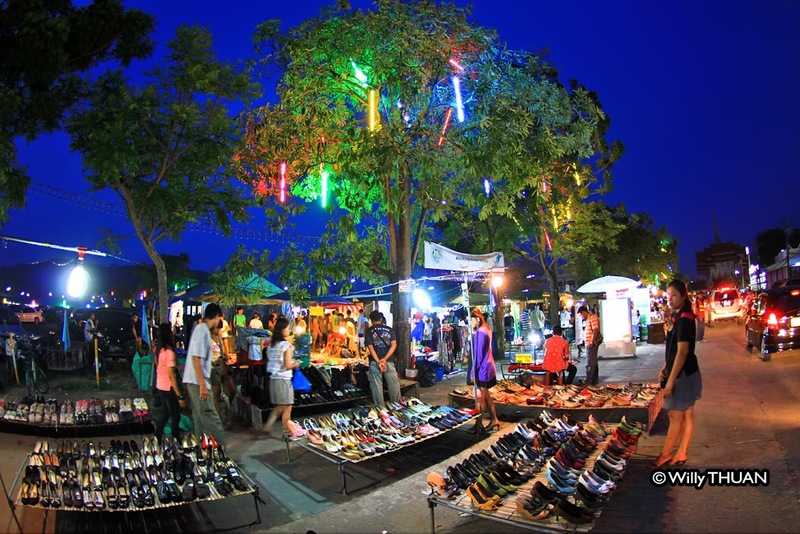 Occasionally it’s even called ‘Phuket Chatuchak’ by reference to the giant Chatuchak Weekend Market in Bangkok and Thais call it ‘Talad Tairod’, which means ‘Car Boot Sale’. 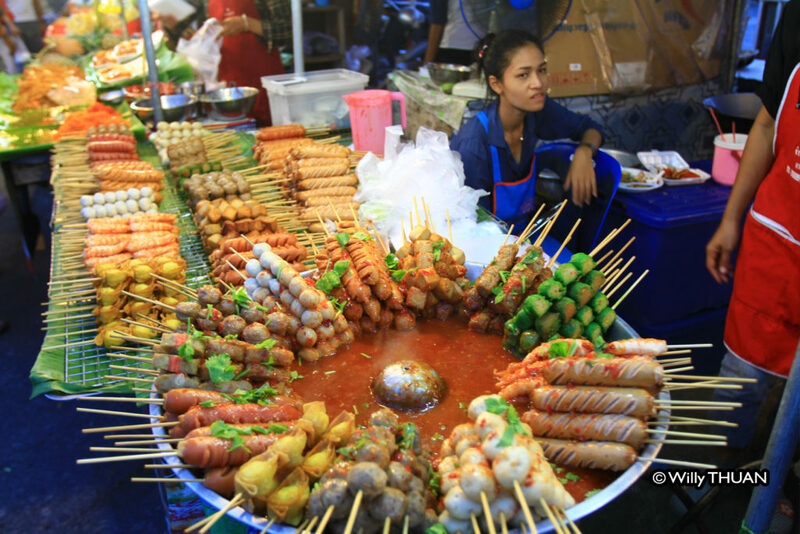 Actually ‘Naka Market’ seems to be the name everyone is now using. 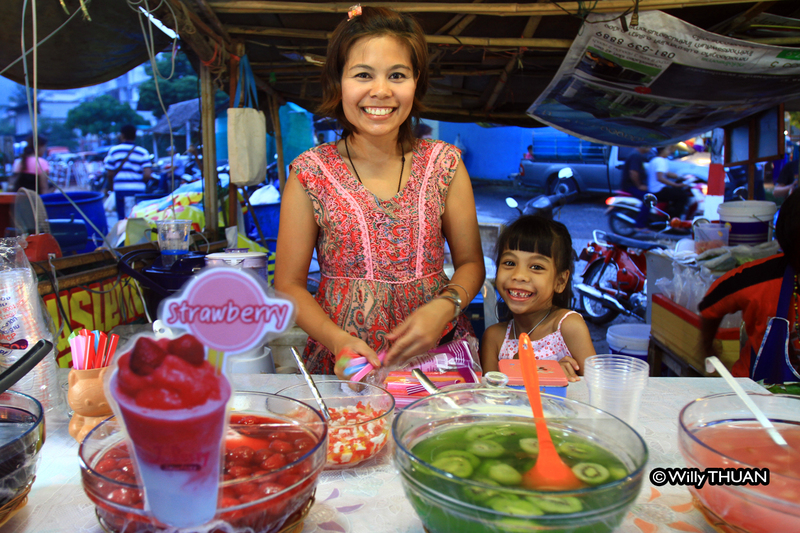 The Phuket Weekend Market is big, crowded, hot, fun and almost overwhelming! 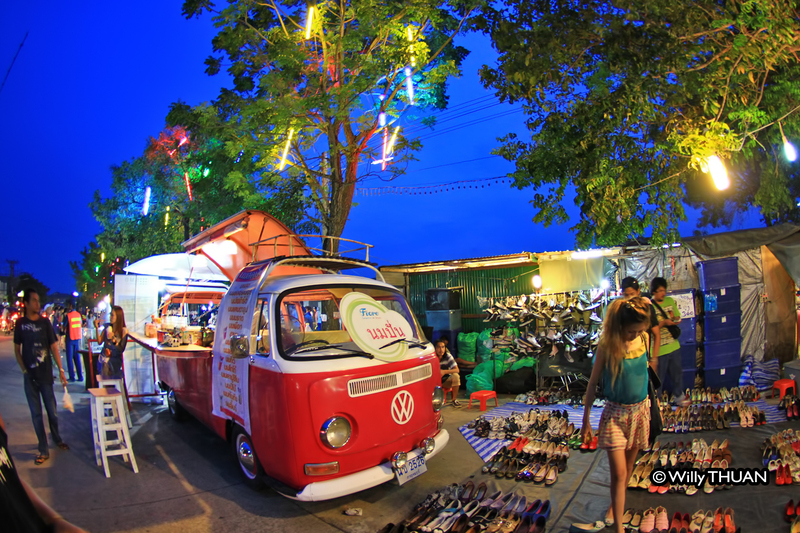 You can walk in here for hours, looking at this vast bric-à-brac that makes this kind of night market fun, everything you don’t need is here, and most of it is fake! You can divide the Naka Market into two sections: 1) the shopping and 2) the food, which is also a lot of fun, don’t miss it! A lot of clothing, most displaying famous brands, but the low prices give a hint about their authenticity. 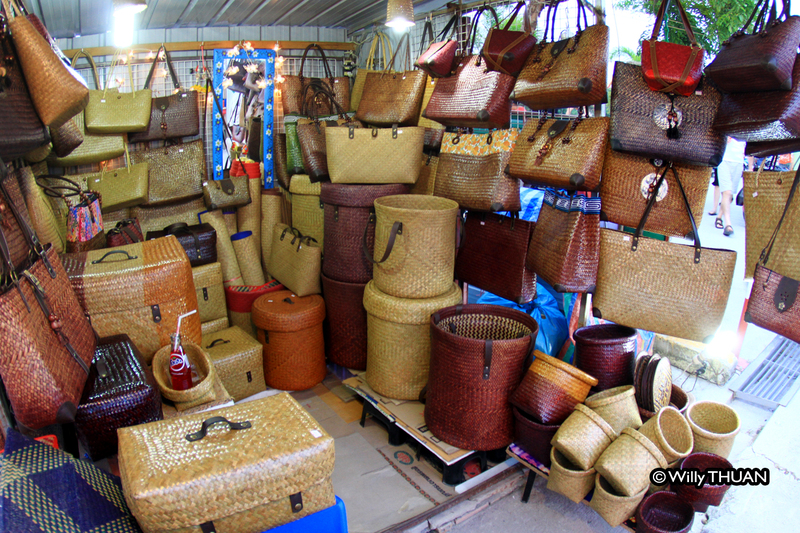 If you enjoy this kind of shopping, you’ll have tons of fun, but you might also realise sooner than later that material, shape and quality doesn’t compare either. Bags, watches, accessories and even perfumes, of course, follow the same rule. If you look well, you might find some excellent local designers, so there is hope after all. 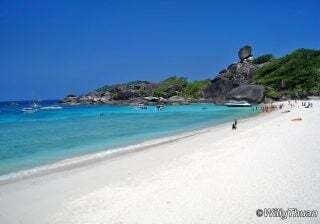 Then loud music will irresistibly attract you to some of the biggest DVD copy shops on the island… everything recent is here, some of them even before being out in theatres! Once again, quality doesn’t go well with cheap, these are smart guys and the demos they will show on their TV screen always looks good but once home… surprise! When you see how much copy stuff is openly on sale in this weekend market and realise that no vendor seems particularly stressed, you get an idea of the efficiency of the anti-piracy campaigns. But well you know how it works, as long as demand is strong enough; I’m not here to judge. Then comes one of the most surprising shops! The second-hand shoe shop! I always wondered if it should be called ‘ Second-foot shoe shop’ but whatever… Ask yourself: would you be wearing used shoes? I once had my shoes stolen long ago in front of my house, and I always thought how funny it would be to find them back in such a place. 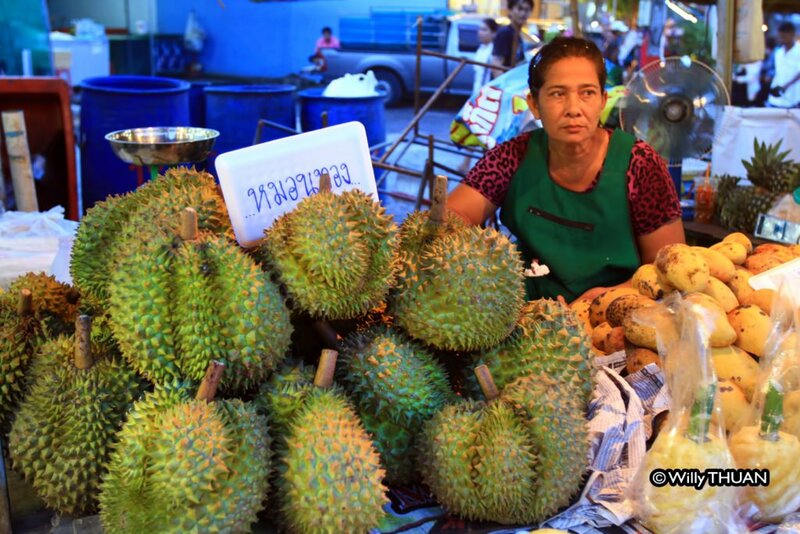 We even added it to the 14 Weird and Funny Things in Thailand. Here is your chance to taste a lot of fun things, all the classics are here, fried, deep-fried, boiled, steamed, crushed, chilled, rolled, sliced and fermented. 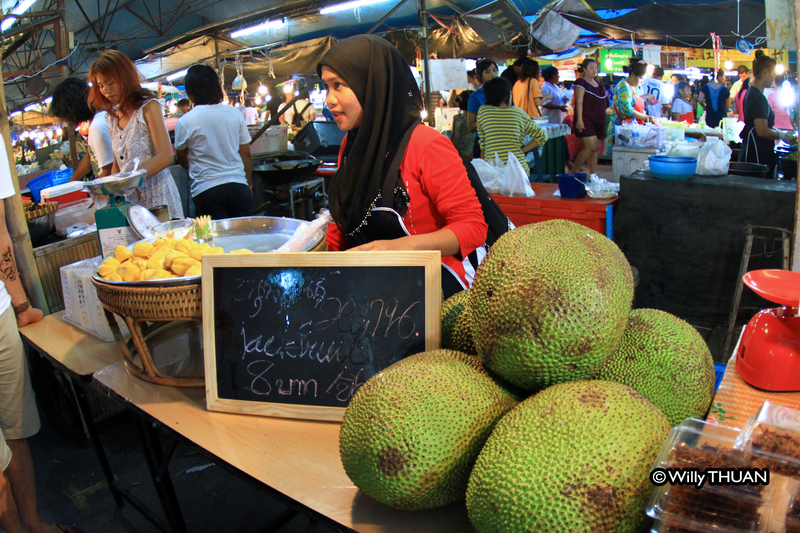 Don’t be shy, try all you can (even the giant Jack fruits and durian!). 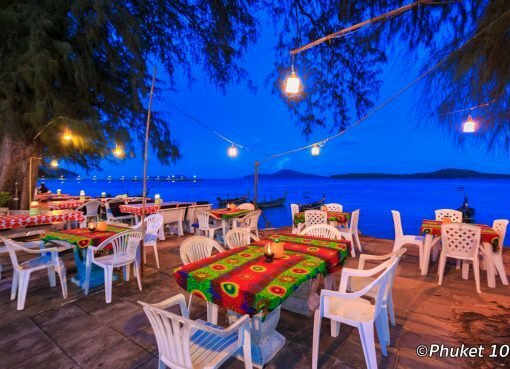 Like most people, pick something and nibble as you walk, sit down at one of the shop’s tables or eat at one of the back restaurants. 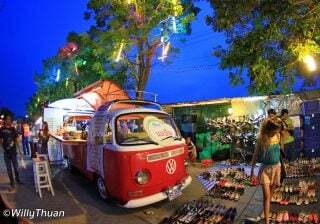 From Central Festival Phuket, take direction Rawai Beach and turn left at the second traffic light and it’s right there. 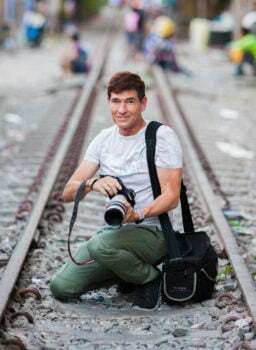 There is ample parking in the back, but I usually try to park on the road, it gets jammed at night. 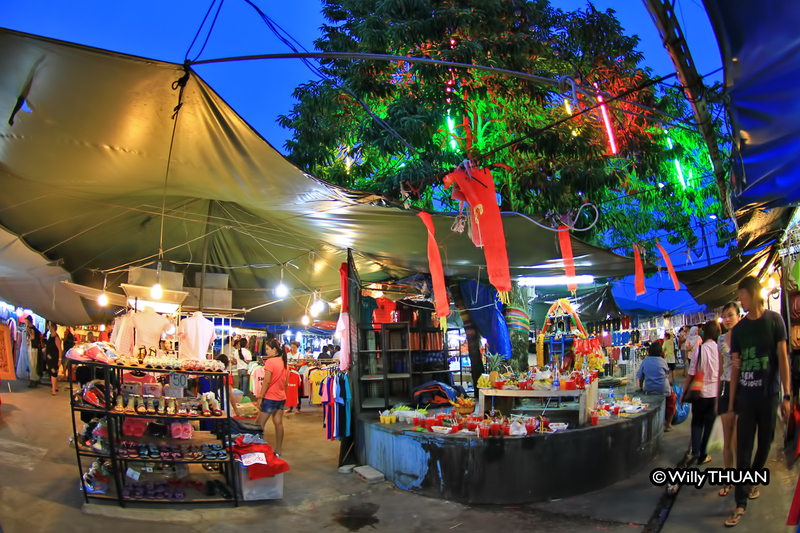 There are few other markets in Phuket Town. 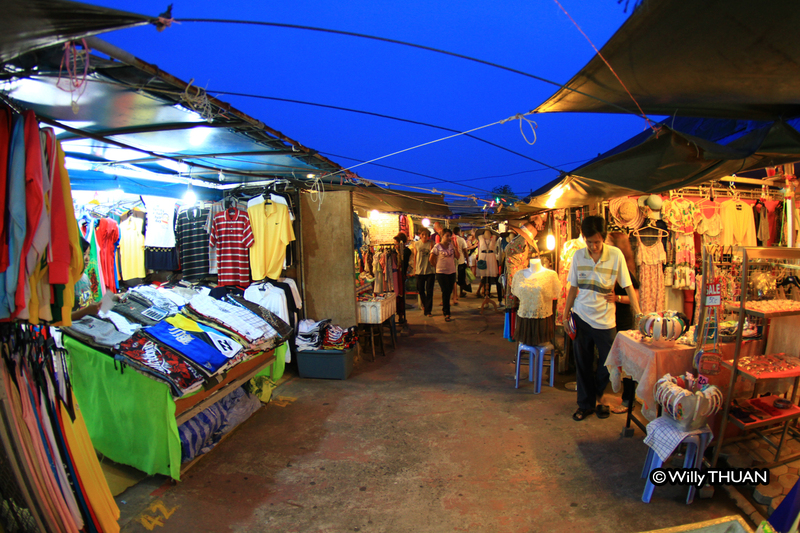 One is called ‘Phuket Indy Market‘, which is essentially young Thai designers trying to make a name or a bit of money. It’s small but pretty good and a lot more inspiring. 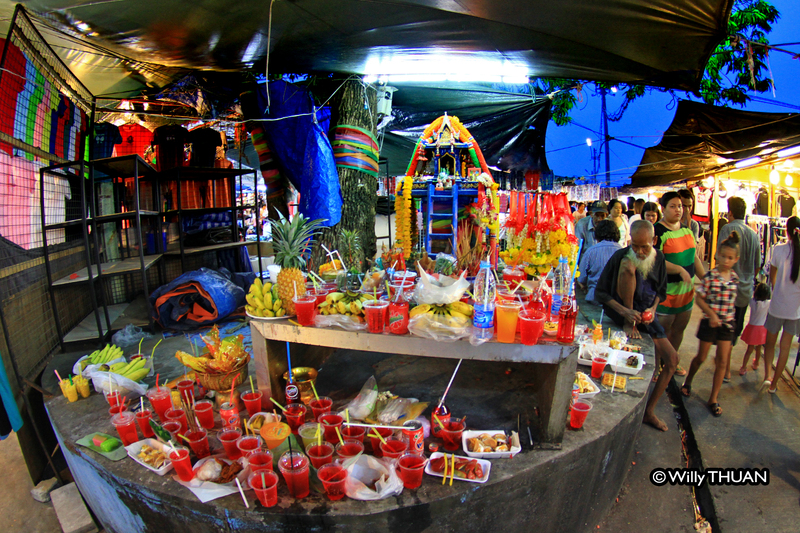 If you like markets, read about Chillva Market Plaza and Phuket Walking Street Market but also about the many types of Phuket Night Markets or even about Bangkok Chatuchak Market.